Lomellina: a land of fires? Part 2: danger and cancer. Is Lomellina a land of fires? Part 2: danger and cancer. In the first part of our investigation we suggested a comparison between the land of fires around Salerno and the recent fires in Lomellina. This is not because Lomellina is in a comparable situation, for what concerns severity and extension, to the one in Campania, but it is because of suspicious coincidences and parallelisms, that made us fear a future in which this comparison wouldn’t be so wild. In both cases, actually, unlawful disposals happened in order to avoid the costs required for regulated treatment: these are choices that cause tremendous consequences for the environment and the health of the people living in that area. According to what stated by the Istituto Superiore di Sanità (ISS), illegal waste burning spreads extremely high percentages of polluting substances in the air, such as dioxins (clearest example: Mortara), a class of organic compounds that can originate from processes of uncontrolled combustion, that involve mostly plastic materials. These are extremely reistent to chemical and biological degradation, and they find in water and air currents the best way to diffuse. Because of their lipophilicity, dioxins, over time, tend to accumulate in human and animal body tissue, contributing this way to the growth of tumors. 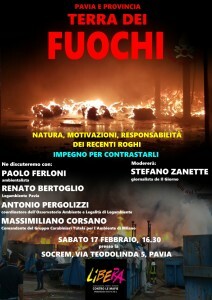 In order to expose this reality and these fears in a better way, the Libera guard of Pavia has organized, on the 17th February of this year, an open meeting for the citizens, called “Terra dei fuochi” -land of fires-. A meeting arranged in order to understand if these phenomenons could be actually compared, and if a connection could actually exist. According to Renato Bertoglio (member of Legambiente), the cases are not similar, even if since 2014 there have been more than 250 fires in waste treatment plants, and, according to the Ecomafia enquiry of 2017, there have been 25889 environmental crimes reported on a national scale: it seems that there are 71 fires per day, one every three hours. In Lombardy we can count, in 2017, 33 fires in waste plants, the majority of which are distributed in the districts of Milano (8), Brescia (7) and Pavia (6). At the moment, it is not possible to state with certainty if this phenomenon is already well organized and diffued in the north, but the risk exists, for sure. For what concerns the pyres in Lomellina, according to a volunteer of Libera, that has asked to be anonymus, <<it is possible that at least some of these are connected to an attempt of an unlawful disposal of special and dangerous waste; this waste could have been placed in hangars such as the one in Corteleona in January, or maybe grouped together, in a completely illegal way, with ordinary waste: the fires could have been be used in order to get rid of it once and for all, avoiding the authorities. The machanisms are similar, but it remains to be understood if the offenders are the same. The sector of illegal waste disposal has a well organized structure and, often, there is more than just one organization behind: it involves, apart from criminal organizations, even the business structure and the politics. It is still unclear if there is a certain organization that is more interested than others in this illegal disposal: judicial inquiry is the only way to state this. At the moment, no option has to be ruled out. But, it has been proved that ‘Ndrangheta is the most powerful mafia in Italy, and that it has been settling in Lombardy for at least 40 years. It is actually less easy to figure out what its role could be: italian mafias don’t always directly entrust the execution of determinate activities to their men, they rather commit these actions to other organizations or collect a certain percentage, otherwise they work at a “superior” level, managing logistic networks: money flows, contacts and clients in politics and entrepreneurship. This way they manage to coordinate manifold illegal activities avoiding to get their own hands dirty. But we can’t state with certainty if this is the same scheme that’s being used for waste disposal. 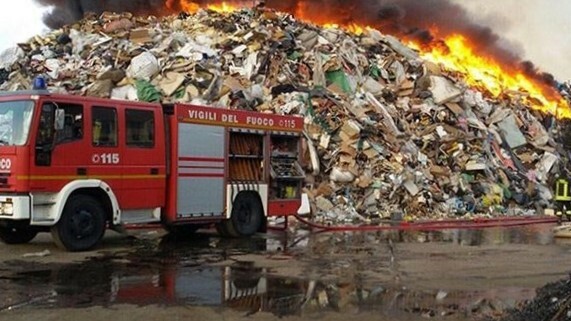 Anther factor that could have caused the fires in Lomellina is the presence of incinerators, since it is extremely easy to disguise what, instead, is an illegal traffic of waste that should never be disposed in incinerators. Moreover, the chinese restrictions about waste could have carried weight on the issue>>. In fact, since the 1st January 2018, China has been blocking the import of plastic and waste from Europe; this way, millions of tons of garbage will remain inside the european borders, and this could have had created the necessity of finding antenative and illegal ways to get rid of them. One example can be the fact that from 1995 to 2016 this import has come to 45 million tons, from the initial 4,5 millions. More than half of global export of copper scraps and waste paper, for instance, and more than half of plastic waste are destined to chinese market. The commercial value of chinese import of raw materials for recovery has exceeded, in 2017, the value of 18 billions of dollars. If China nowadays is producing 525000 tons of trash per day, according to the World Bank in 2025 these tons will be 1,4 millions. This is the reason why the government wants to support and promote the start and the development of a national recycle industry. According to the Ecomafia enquiry of 2017, history and numbers in the environmental crime, waste disposal is a very profitable sector: it seems that enviromental crime business is worth 13 billions. <<The disposal of some categories of special waste is actually really expensive, and for this reason it is more convenient for the industries to recruit local criminals in order to get rid of it, paying a price that is inferior (but by any means considerable) to the one they would pay to dispose of waste in a legal way>>. The public sector, that is responsible for the disposal of ordinary waste (and not only: think of waste that is produced in hospitals), is not unaware of this logic. <<Many times – explains the volunteer from Libera – industries that dispose the wastes of some italian cities happened to be in business with gangs, when not directly managed by them. The pyres are usually the final part of this process, when waste gets burnt in order to be eliminated. Many times, entrepreneurs or politicians are the ones who look for criminal organizations, because they apparently know how to treat waste. Mafias started to offer these service because industries started to ask for it. The problem therefore cannot be solved by simply hitting criminal organizations, because, as long as there is demand, someone will certainly provide supply. It is only by changing certain logics, with the power of Law but also civic commitment and awareness, that we can hope to find a solution. Understanding, asking, inquiring or checking facts is, of course, the first and fundamental step in making sure that awareness and interest regarding local territory actually reaches the social community. Institutions alone aren’t enough; only a collective action will extinguish the fire.